Men and women sit together and participate as equals in all aspects of the service. A part of all services is read in English, using our prayer book Siddur Lev Chadash. A mixed choir of members sings, often with organ accompaniment. Our Shabbat Morning service is at 11.00am each Saturday. We have monthly tots Shabbat services which aimed to be inclusive for young children, and services for all the major Festivals. Our Friday evening services are at 6:30pm other than the third Friday - details are in Hakol or on the Diary page. Members are expected to participate in the security rota. For full details of all our services see the current diary. We use Siddur Lev Chadash for all our Shabbat and Festival services, and Machzor Ruach Chadashah for the High Holydays. From its outset Liberal Judaism has tried to make its services more attractive, understandable and intellectually acceptable. Our prayerbooks, published by Liberal Judaism, continue a trend towards a more traditional format but with a great deal of innovative and creative liturgy. You will also find new prayers and interpretations which add to the richness of our services. New users particularly notice that the translations are 'gender inclusive'. The sources of all the prayers can be found at the back of the book. At Elstree we celebrate happy events and support our members in difficult times throughout the lifecycle. 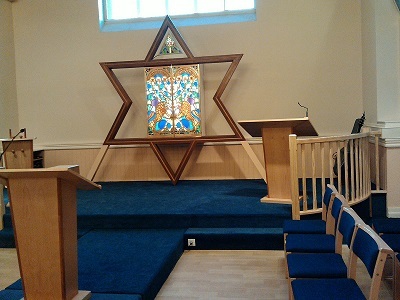 Weddings: Our Synagogue is always popular as a venue for this happy occasion. We encourage both bride and groom to be called up to the Torah (the "Aufruf") on the Shabbat prior to their wedding. We can also offer a Mixed Faith blessing after a civic marriage, where either partner is Jewish. Thanksgiving for a new Child ("Baby Blessing"): This ceremony, part of our Shabbat Service, enables both parents to thank God for the safe delivery of their child and enables grandparents, relatives and friends to share this precious moment with members of our congregation. Bar/Bat Mitzvah: At TLSE we encourage both boys and girls aged 13 to celebrate their Bar/Bat Mitzvah by taking part in the Shabbat Service. They read from the Torah, and depending on their ability lead the congregation though part of the service. Our booklet on preparation for Bar- and Bat Mitzvah is reproduced here. Kabbalat Torah: As children mature towards adulthood the Kabbalat Torah ceremony at age 15 allows boys and girls to affirm their commitment to Judaism. Illness: Our Rabbi and members of our Care and Welfare committee regularly visit the sick in hospital and people who are ill at home. They can always be contacted at the Synagogue for help and support. Death: Burials and cremations are organised through the Synagogue using our grounds at Edgwarebury Lane or Cheshunt. Rabbi Tobias will conduct funerals and shivas whenever possible. Yahrzeit: We will remind you of the dates of your yahrzeits if you inform the Synagogue Office appropriately.